Tour de France: Who will win the White Jersey? It’s said the mark of a champion is to win the Tour de France right from the start. Eddy Merckx, Jacques Anquetil and Bernard Hinault are amongst those who came, saw and conquered the race in their first attempt. But most Tour winners take time to establish themselves and the Tour de France’s best young rider competition is a useful staging post and prestigious line for the CV. However a look at the past winners suggests the white flower of youth rarely blooms into a Tour de France winner. Who will win this year? Here’s a brief analysis of the contenders, the rules and the history of this jersey. Plus there’s an explainer of what happens when a rider leads more than one competition in the Tour. The rules are simple, the jersey is worn by the best rider on the overall classification born on or after 1 January 1988. 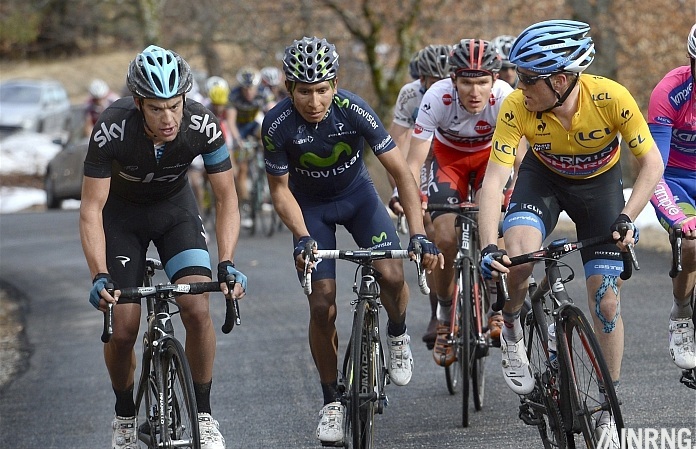 This gives us a three way contest between Tejay van Garderen, Thibaut Pinot and Nairo Quintana. Each rider is a contender for the overall win so I’ll skim over the scenarios so as not to spoil the upcoming assessment of the contenders for the race overall. Tejay van Garderen (BMC Racing) is first because he won the jersey last year on his way to finishing fifth overall in a ride at times delayed by trying to help Cadel Evans although arguably setting the tempo kept him fresher. Of the three picks, van Garderen is a genuine pick for the podium in Paris. He’s been fourth in Paris-Nice, third in the Criterium International and won the Tour of California. All is building well and he’s a steady rider, a smooth running diesel whose powers of recovery should suit the final week. Nairo Quintana is the next pick. Don’t fall into the trap of thinking Colombian=Climber because he’s a versatile rider. Yes he can defy gravity in the mountains but he’s useful against the clock and won the Tour of the Basque Country thanks to the time trial. He will struggle in Stage 11 but can limit his losses. Thibaut Pinot was 10th overall last year, not bad for the youngest rider of the race in his first go and a late entrant too. He took a stage win and then proved durable in the mountains, one of the few able to follow Chris Froome and Bradley Wiggins. His weaknesses are the time trial, positioning in the bunch and descending. But he’s got a steely side and with the right motivation he can stay out of trouble and again this year’s route means he’ll lose time on Stage 11 but will hope for a stage win and more in the mountains. There are more than three candidates of course. Andrew Talansky (Garmin-Sharp) has shown he’s got what it takes. Ion Izaguirre is Euskatel-Euskadi’s rider. Romain Bardet (Ag2r La Mondiale) is a big talent but should on team duty albeit with a few cards to play. OPQS bring Michał Kwiatkowski who had been targeting the Tour of Poland with ambitions to tame both the Passo Pordoi and a 37km solo time trial and if he’s good enough for that, he could be in pole-position for white too. Introduced in 1975. As Wikipedia puts it “on four occasions a cyclist has won the young rider classification and the general classification in the same year — Fignon in 1983, Ullrich in 1997, Contador in 2007 and Schleck (retroactively) in 2010.” Worryingly if you strip out these precious winners only two other riders have won white and yellow during their career, Greg LeMond and Marco Pantani which suggests the white jersey winner is not the revelation might imagine. Certainly it can reveal talent at the highest level but there’s a surprisingly poor correlation between winning white and winning the Tour in subsequent years. This means a rider who leads the points and mountains competition would wear green whilst the best young rider leading the mountains competition would wear the polka dot jersey and so on. If a rider has two jerseys, one is given to the second-best rider in the competition to wear. They only wear it for the day and don’t get the podium ceremony nor a box of spare jerseys to give away. In the event that the world champion or national champion inherits a distinctive jersey of the Tour by default of second place in the competition they would not wear it because their champions jersey takes precedence. Does that mean that if Cav does take the yellow or green jerseys he will still remain in the British champions jersey? Only if he’s in second place in the competition and inherits the jersey. For example imagine if André Greipel leads in yellow and green ahead of Cavendish after Stage 1, then the German would wear yellow but Cavendish would normally wear green for the day, only because he’s a national champion he would not. I’ll make the text above clearer. I was asked last year a few times too so this should be a useful reference point. Hmm, but how many jerseys in a box? Thanks for refreshing us the hierarchy of jerseys. If I’m not mistaken, the points classification, being the 2nd classification, is also the tie-breaker for the yellow jersey. So that the GC, if two riders finish with the same time, could be decided by their green jersey standings. First they go down to the 100ths of a second. I assume we’ve never seen this latter scenario happen? Would have a pretty strange effect on the last stage processional. They only time to 100ths of a second on time trials; when there hasn’t been a time-trial yet, they are much more likely to split ties using positions. As, in fact, happened this year – indeed it was still happening between Orica GreenEdge riders after the team time-trial (as they, obviously, all get the same time in the TTT, including hundredths). In the cases you’ve outlined above where the world or national champion doesn’t wear a jersey, what happens to it then? Does no one wear it or does it go to the third placed rider? I presume you are not counting Andy as a white and yellow winner? He’s there, see the text again. I’d like to mention Cameron Meyer, born on 11 January 1988 he’s just eligible for the white jersey competition. I don’t expect him to win, but he’s been improving a lot and was the OGE leader for Tour de Suisse where he finished 10th. Could he make top 3 white, or is that out of the question? I’m also interested in seeing how Michał Kwiatkowski goes too. There is always the possibility that the white contest might be lot more nip and tuck than the GC! Good pick but I was thinking he could contend but when it comes to the climbing he’s behind TvG, Quintana and Pinot. I think Fignon won the TdF in his first attempt in 1983. Yes, he’s won of the few successes. I left his name out as we had three picks already. Right. I was thinking of him in the vein of “the mark of a champion is to win the Tour de France right from the start.” I have a soft spot for Fignon, so I want to mention him when I can!! The interesting thing here could be team orders. Quinatana, Tejay and Talansky could all be riding for a better placed teammate. Pinot should have support of his team, while Kwiatowski will have a free hand in the mountains. Could be a decisive factor on certain stages. I have to admit, a big part of me is more excited for the white jersey competition than the yellow jersey. What happens to the jersey if 2nd place doesn’t take it? On to third place or does it take a day off (so to speak)? It goes down to third place and can only go as low as fourth place. For example if the race leader led every competition too but then second and third place were world and / or national champions. Ah, cheers. Always something new to learn where cycling is concerned! so with the number of national champions in the favourites for the first stage and the stage winner to take green as well as yellow, we could see the green jersey missing from the peloton on the 2nd stage! Inrng – any insider info on Romain Sicard? He just sneaks in, being born on Jan 1, 1988 and (as I’m sure you know) won the junior worlds in 2009 and the Tour de l’Avenir, beating the likes of van Garderen and Quintano. He’s been struggling with Euskaltel-Euskadi ever since while his cohort have been ripping it up. Great article as always, White jersey competition is always a great subtext and nearly always exciting, think maybe it doesn’t quite correlate to future Tour winners because alot of the young riders tend to get in breaks and gain time and the jersey that way, Much like Pinot last year when he won stage 8. Previous post: Tour de France: Who will win the Mountains Jersey?